Earn $22.95 in Rewards credit (2295 points) What's This? Cannondale's 2019 Quick 3 Disc Women's Bike features remarkably lightweight Smartform C2 Alloy construction, responsive and durable Shimano M315 hydro disc brakes, flexible gearing, and comfortable yet fitness-oriented geometry, making it a fast, fun way to get fit or get around town. Frame: Quick SL Disc, SmartForm C2 Alloy, SAVE, tapered head tube. Fork: Quick Disc, full carbon. Headset: FSA Sealed Bearing, integrated. Front Derailleur: Shimano Sora, 31.8 clamp. Rear Derailleur: Shimano Sora GS. Bottom Bracket: Cartridge square taper. Brakeset: Shimano M315 hydro disc, 160/160mm. Handlebar: Cannondale C3, 6061 Alloy, 3° rise, 10° sweep, 640mm. Stem: Cannondale C3, 6061 Alloy, 31.8, 6°. 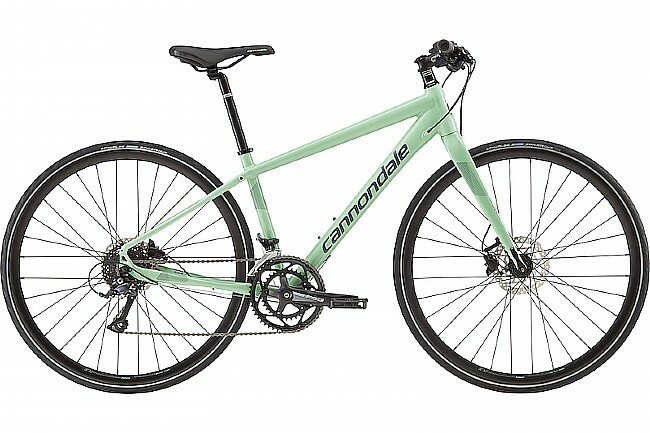 Saddle: Cannondale Fitness Women’s Ergo Double Density. Seatpost: Cannondale C4, 6061 Alloy, 27.2x350mm. Wheelset: Cannondale C4 Disc, double wall, 32h. Rims: Cannondale C4 Disc, double wall, 32h. Spokes: Stainless steel, 14g, 32h. Axles: 12x100 front, QR rear.